1. Add 1/2 cup of vinegar to warm bath water when bathing and get double beneftis softer skin and a cleaner bathtub with less work. 2. Vinegar makes a simple, inexpensive conditioner for your hair and helps remove the sticky stuff shampoo can leave behind. About a tablespoon will do it. 3. Simply pour a few tablespoons of vinegar on your hair and massage into your scalp. Wait a few minutes, then rinse and wash hair like normal. 4. 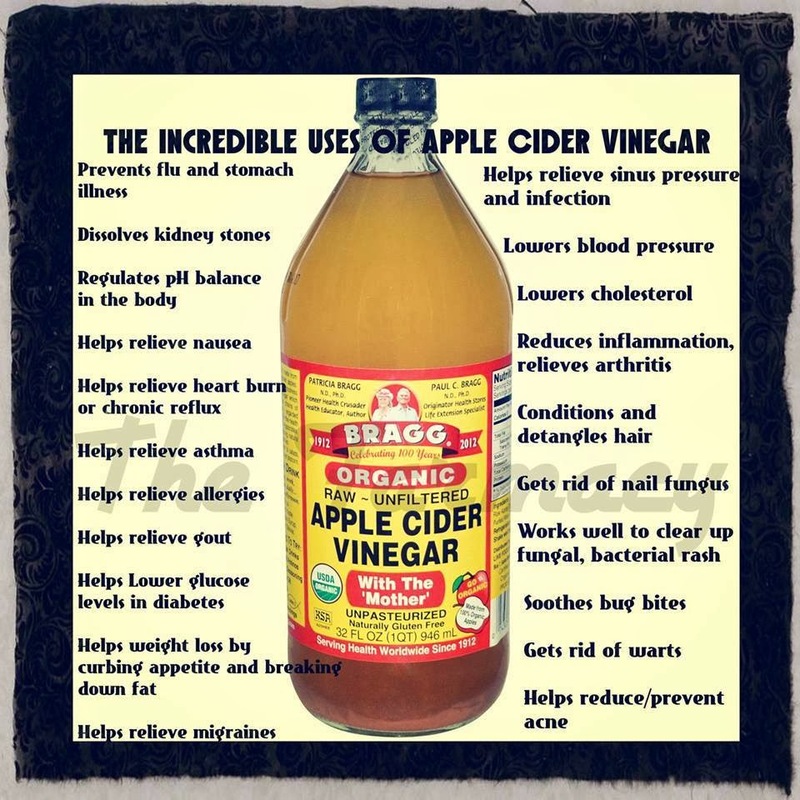 Vinegar naturally helps to remove fat from the body - apple cider vinegar is especially good for this. Drink some in a glass of water a few times a day, and add a little lemon or honey for a nicer flavor. This will also help reduce your appetite. 6. Soak dentures overnight in vinegar, then brush away tartar with a toothbrush. 7. Take 1 cup of vinegar and water into a large glass and use to rinse your hair after you shampoo. Vinegar adds highlights to brunette hair, restores the acid mantel, and removes soap film and sebum oil. 8. Add 1 tablespoon of vinegar to the rinse water when washing and your pantyhose will last longer. 1. Mix with water or simply sprayed full-strength on glass and mirrors, vinegar does a great job quickly and easily. Simply wipe windows dry with crumpled-up newspapers and watch your windows sparkle. 2. Use it full-strength to polish car chrome with a cloth and see it shine! Use it on your car's windshield and windows, too. 4. Periodically run a gallon of distilled vinegar through your washing machine to clean it thoroughly, get rid of soap scum, and clear out the hoses. Run the machine through the warm water wash cycle empty and then add the vinegar during the rinse cycle. 5. Make your own furniture polish with one part vinegar and three parts lemon oil or olive oil. 6. Paint price tags or stickers with several coats of vinegar and let it soak in. Depending what you are removing them off of is whether they'll slide off easily or require a little heavier rubbing. 7. Put vinegar in the water holder and let it steam itself clean. Remember to flush it with water when you are done. 8. Simmer paintbrushes in pure vinegar, then wash in hot soapy water. 9. Wipe down your walls with a vinegar-water mixture and it will help absorb odors and clean the surfaces. 10. Use a vinegar-soaked cloth to remove spots from any glassware or crystal. 11. Pour boiling white vinegar down clogged drains to remove the clog. 12. Remove odors and stains from jars by cleaning them out with vinegar. 13. Soak a piece of bread in vinegar and let it sit in the lunchbox over night. 14. Make vinegar ice cubes and feed them down the disposal. After grinding, run cold water through or mix equeal amout of vinegar and baking soda and putting it down the drain. after letting this fizzing mixture sit for few minutes, flush out with warm water for a clean and stink-free sink. 15. Boil a mixture of water and vinegar in the teapot. Wipe away the grime. 16. Run a cup of vinegar through the whole cycle once a month to reduce soap build up on the inner mechanisms and on glassware. 17. Boil a solution of 1/4 cup of vinegar and 1 cup of water in the microwave. Will loosen splattered on food and deodorize. 20. Remove stubborn stains from furniture upholstery and clothes. Apply vinegar directly to the stain, then wash as directed by the manufacturer's instructions. 21. Vinegar is a natural air freshener when sprayed in a room. 22. Soak rusted tool, bolt, or spigot in undiluted vinegar overnight. 23. Pour in one cup of vinegar, let it stand for five minutes, and flush. 24. Add a 1/2 cup vinegar to the rinse cycle. 25. A cloth soaked with vinegar for sanitizing kitchen counters, stove, and bathroom surfaces. This is just as effective as the anti-bacterial products and does not promote resistant strains like the commercial products can, this is also a cheaper and greener way to protect your loved ones. 27. Dip a toothbrush in vinegar and gently brush over grease spot. 28. Apply one part vinegar to four parts water, then rinse to remove perspirations stains from clothing. 29. A mixture of salt and vinegar will clean coffee and tea stains from chinaware. 30. Vinegar can help to dissolve mineral deposits that collect in automatic drip coffee makers. Fill the reservoir with vinegar and run it through a brewing cycle. Rinse thoroughly with water when the cycle is finished. 31. To ride of fruit flies,set out a small dish of white vinegar and some smashed fruit, covered with plastic warp with some holes in it, the flies crawl into the trap and can't get out. 2. Add a teaspoon or so of white vinegar to your cooking water while cooking cauliflower - it will retain a whiter color. 3. Add a bit of vinegar and give it a good shake and you'll have a bit more! 4. Add a bit of white vinegar to the water you're boiling your eggs in, and the shells won't crack. 5. Add a bit of vinegar to the water you're cooking your cabbage in to remove that stinky cabbage smell. 6. Add 1 teaspoon vinegar for every three egg whites and you'll have fluffier meringues. 8. To cook rice without sticking add a spoon full of vinegar in it. 9. Eliminate onion odor by rubbing vinegar on your fingers before and after slicing. 10. Clean and disinfect wood cutting boards by wiping with full strength vinegar. 11. Make buttermilk. Add a tablespoon of vinegar to a cup of milk and let it stand 5 minutes to thicken. 12. If your leafy veggies are wilted, soaking them in cold water with a little vinegar can perk them right up. 1. Remove white salt buildup on old clay pots by soaking them in full strength vinegar. 2. Undiluted vinegar will kill grass between bricks and sidewalk cracks. 3. Spray full strength on weeds - be careful not to spray it on the surrounding grass as it will kill that too. 4. Spray vinegar around doors, appliances, and along other areas where ants are known to gather. 5. Sprinkle vinegar on areas you don't want the cat walking, sleeping, or scratching on. 6. Add 2 tablespoons vinegar and 1 teaspoon sugar for each quart of water to freshen cut flowers. 1. Mix a teaspoon vinegar with a glass of water. Gargle with the mixture and then swallow to relief sore throat. 2. To remove calluses,try soaking your feet in a combination of white vinegar and warm water nightly and watch your feet soften noticeably. 3. Soak a washcloth in vinegar and gently apply it to sunburned skin for cool relief. Reapply as needed as it evaporates. Besides sunburn, vinegar also soothes the itch and irritation of bee stings. 4. Arthritis Tonic,two tablespoons of apple cider vinegar in a glass of water, several times a day. 5. Jellyfish Stings,dot the irritation with vinegar and relieve itching. 6. Sinus Infections and Head Colds ,add 1/4 cup or more vinegar to the vaporizer. 7. Mix one part Apple Cider Vinegar to one part glycerin into a lotion and apply daily to warts until they dissolve. 8. Drink two teaspoons Apple Cider Vinegar in one cup water to soothe an upset stomach. 9. Use a cotton ball to dab mosquito and other bug bites with vinegar straight from the bottle. 1. Add a teaspoon of vinegar to your pet's drinking water to encourage a shinier coat, and reduce odor. 2. Use vinegar straight to remove skunk odor from your pet's fur. 3. Sprinkle or spray vinegar on areas you don't want the cat scratching on. 4. Eliminate that ugly deposit in the gold fish tank by rubbing it with a cloth dipped in vinegar and rinsing well. 5. Remove pet stains from carpets blot up urine with a soft cloth, flush several times with lukewarm water, then apply a mixture of equal parts vinegar and cool water. Blot up, rinse, and let dry.